Dealing with acid reflux on a daily basis is no walk in the park. However, you are not alone. In America, 60 million people suffer from symptoms of acid reflux every month. Out of those 60 million people, 25 million suffer from symptoms every day. These symptoms can last for about two hours on average and include heartburn, chronic cough, hoarseness, difficulty swallowing, and bad breath. To learn about the negative effects on your oral and overall health acid reflux causes and how to protect yourself, keep reading this post from your dentist in Estero. Patients who deal with acid reflux regularly are at a higher risk of experiencing dental erosion, according to your dentist in Estero. This is because dental enamel that’s exposed to stomach acid will very easily erode. Because of this symptom, your dentist can easily tell when acid reflux is likely present. Enamel erodes at a pH of 5.5 and stomach acid has a pH level as low as 2. This makes teeth significantly vulnerable to stomach acid that erupts as a result of acid reflux. Acid reflux isn’t only damaging to your oral health. It can also lead to future problems, including gastroesophageal reflux disease (GERD) and even esophageal cancer. About 20 percent of people diagnosed with acid reflux will develop GERD later in life. 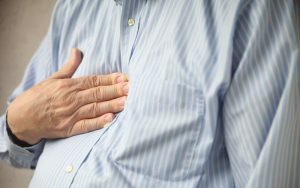 When acid reflux reaches the lining of the esophagus, it can cause open sores, ulcers, and eventually narrow the esophagus as it heals. In some cases, acid reflux can also reach the upper esophagus and spill into the throat, which is even more sensitive to stomach acid. Avoid foods that trigger acid reflux symptoms, including tomatoes, citric fruits, coffee, chocolate, garlic, onions, and other foods that are spicy, acidic, or high in fat. Visit your dentist for an oral exam every six months. Take medications as prescribed to reduce symptoms associated with acid reflux. Eat smaller meals and avoid large meals right before bedtime. With these tips in mind, you can prevent future dental erosion and reduce your risk of developing esophageal cancer and GERD. For more advice on managing acid reflux, schedule an appointment with your dentist today! Dr. Rich Gilbert earned his Doctor of Dental Medicine degree from the University of Florida College of Dentistry. He’s prepared to help patients catch and mitigate symptoms of acid reflux whenever possible. To learn more about his practice, contact him at (239) 948-2111 or visit his website.